Sign Saver-Sign Backer-Metal Sign Spacer from Dornbos Sign & Safety Inc. Here at Dornbos Sign & Safety, Inc. we offer a variety of sign hardware to fit your every need. Looking for a bracket to attach a street sign or mounting hardware for posts? Look no further! If you’re unsure of what you need please contact us and we’ll be happy to assist you. Here at Dornbos Sign & Safety, Inc. we offer a variety of sign hardware to fit your every need. Looking for a bracket to attach a street sign or mounting hardware for posts? Look no further! If you’re unsure of what you need please contact us and we’ll be happy to assist you. 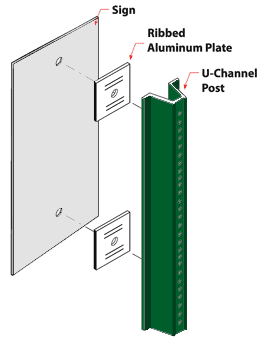 Use our metal spacers between your sign and the U-Channel post for added stability and protection against bending. The metal spacer provides prevents damage that occurs from over-tightening your mounting hardware.